Banana bread is one of my favorite things to eat in the morning with my coffee or tea. It pains me to see those overripe bananas sitting on my kitchen counter, but sometimes, I just buy bananas intentionally for making this bread, just waiting for their skin to become speckled with large brown spots. I just enjoy the good taste of bananas and the tenderness of the bread. This time I added slices of apple, another great layer of goodness. Now, I've always made banana bread with butter or oil but this time I wanted to try it this way, I omitted the butter, and it turned out delicious. But if you want your cake to be moist, just add 1/4 cup of oil. Preheat the oven at 400ºF (200ºC). Arrange the apple slices on a baking sheet and drizzle a little bit of honey over them. Bake them for 10-15 mn, until moist and tender. Remove them, then lower the heat to 350ºF (180ºC). In a large bowl, mash the bananas with the sugar until combined. Add honey, eggs, (and the oil) and beat until combined. Add flour, baking powder, cinnamon, salt, and mix. Grease a round pan, pour the banana batter into the pan. Arrange a layer of apple slices in an overlapping pattern. Bake for 1h at 350ºF (180ºC). Préchauffez le four à 200ºC. Disposez les tranches de pommes sur une plaque à pâtisserie et versez un peu de miel dessus. Faites cuire pendant 10 à15 mn ou jusqu'à ce qu'elles soient tendres et moelleuses. Sortez-les du four et réduisez la chaleur à 180ºC. Dans un grand bol, écrasez les bananes avec le sucre jusqu'à consistance homogène. Ajoutez les 60 ml de miel, les œufs et l'huile et battez jusqu'à consistance homogène. Ajoutez la farine, la levure chimique, la cannelle, le sel et mélangez. Beurrez un moule rond, versez-y l'appareil. Disposez une couche de tranches de pomme en les faisant se chevaucher. Faites cuire au four pendant 1 heure à 180ºC. I love how this apple banana bread looks like blooming flower. Wow. Gorgeous! It's like an apple banana lotus flower. (insert drooling sound) Thanks for sharing! A delicious combination. So unusual. That cake must be yummy! This is my first visit to your blog and this looks amazing! Thanks so much for sharing the recipe. Perfect for brunch. Great recipe without butter. I love the slices of apples on top. 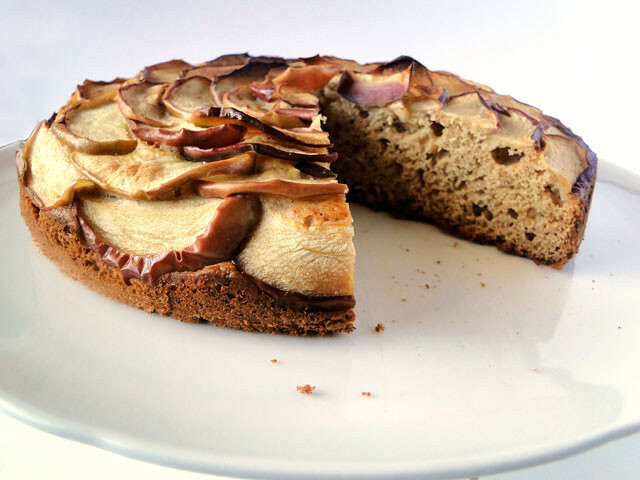 What a gorgeous cake and truly a delicious combination of apple and bananas. Ton gâteau est super élégant a voir et on ne dirait pas du tout que c'est un simple banana cake; les pommes lui donnent beaucoup d'effet. Il me donne faim to gateau! magnifique! This looks awesome! Can't wait to try it. What an incredible idea! It's so beautiful, and I just know it tastes even better than it looks! Wow this looks so impressive. 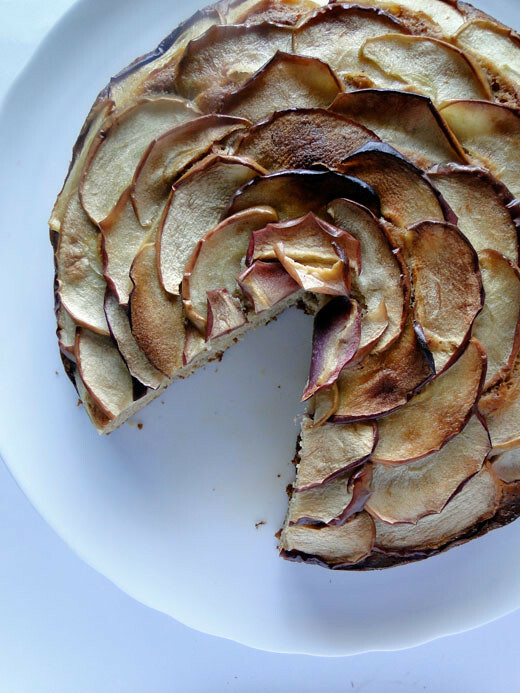 A beautiful banana cake and I love the arrangement of the apple slices on top! Chico, this is a glorious looking cake...nice to see both apple and banana together! This cake looks fantabulous!I have bookmarked it to replicate at my blog in the near future. :). Love how you have arrange the apple slices on top.So artistic! Apple Cake but it doesn't even compare to yours. Thanks for sharing!! Wow it looks stunning! I love how you arranged the apples. Bet it tastes wonderful with mashed bananas in it. 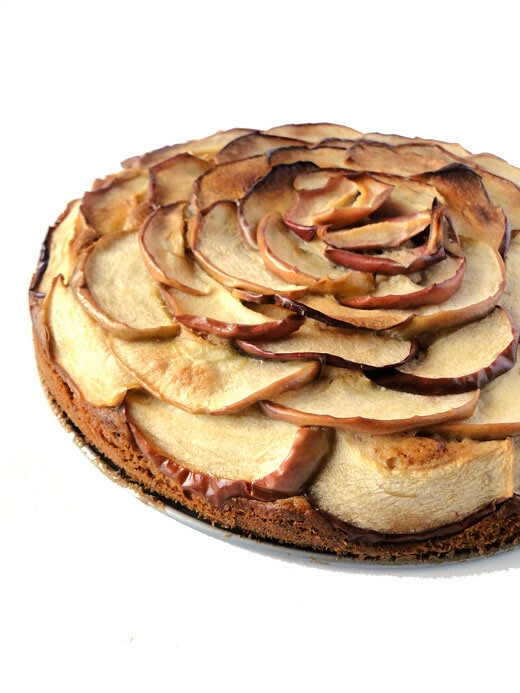 A beautifully presented apple cake! Really love the way you arranged the fruit. This the perfect cake to start the day! Looks really delicious! I love the apple slices on the top. 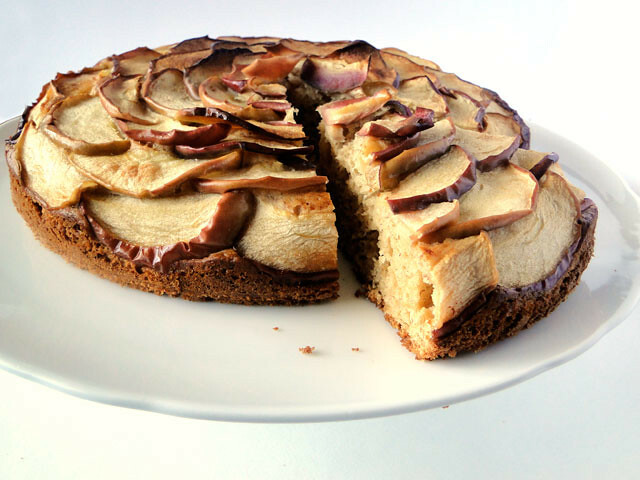 Cherine, what a nice combination...banana and apple...love the way the cake is presented...yummie! Wow, this looks so delicious and healthy too. I can't believe there is no butter/oil. I too, love the taste of bananas in baked goods. I must try this! I love banana cake but never combine it with apples. Looks like a beautiful combination. Thanks for sharing.